I fell in love with Iochroma a few years ago. Say EYE-oh-chrome-uh. One of my clients grew the purple one. Then I saw it again in a friend's garden. It is a large shrub native to South American forests. I've seen them grow to 8' tall. They take to pruning well and can be kept around 6'. Research says they only grow outdoors in mild zones 8- 10. 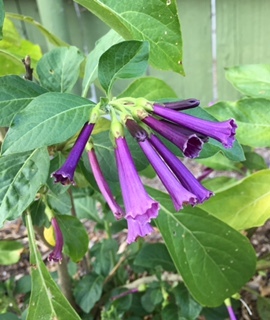 In SoCal inland we are zone 9. They are not frost hardy. But I haven't seen damage here. We had frost last year it not this year because if all the rain. 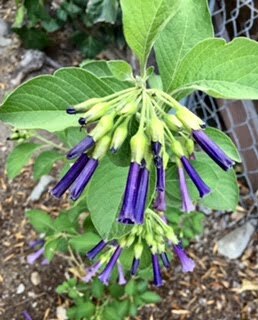 Iochroma is in the Nightshade family of Solanaceae which includes tomato plants and Brugmansia -Angels Trumpets. They attract hummingbirds and bees. I searched for it at many local nurseries without luck. I finally mail ordered the purple, blue and red from Logees Nursery. I love the purple and blue. But the red one I'm not so happy about. It has bigger leaves and very small flowers. We'll see. 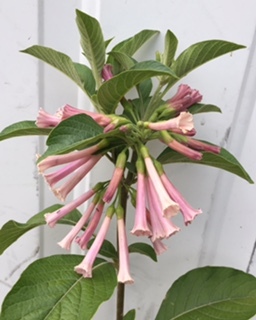 This year I found a pink one that I ordered from Almost Eden Nursery. It came already about 8" tall. I potted it into a 2 gallon can right away and it already bloomed. It's lovely!